Jeewanjee Insurance | Techtronix Corp. 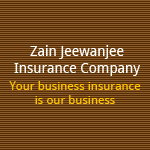 Founded by Zain Jeewanjee in 1985 after discovering a void in the number of agents that fully understood the ever changing business insurance industry. Since its foundation, Zain Jeewanjee Insurance Agency has grown to become one of the Largest Agencies in the Silicon Valley. We are an all lines insurance broker licensed in 42 states. Our focus is to find cost effective risk management solutions for our diverse range of corporate clients. We insure anything from your wedding ring to your international employee’s workers compensation coverage.